People Living with HIV in Illinois: Earn A Chance at a $25 Amazon Gift Card by Taking the 'Good Health Is More Than Health Care' Quiz by Feb 15! 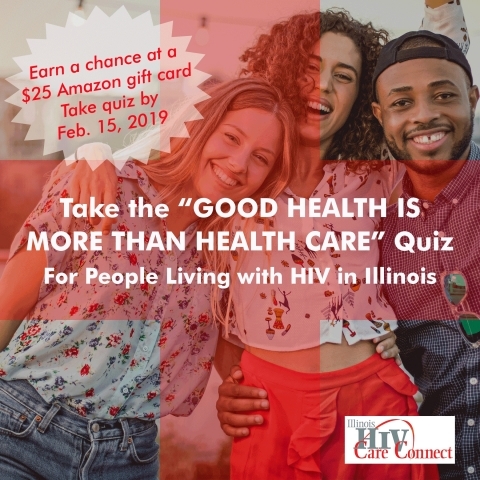 People living with HIV in Illinois have the opportunity to win one of 20 Amazon gift cards, valued at $25 each, by taking Illinois HIV Care Connect's "Good Health Is More Than Health Care" Quiz by Feb. 15, the Illinois Public Health Association announced today. People living with HIV in Illinois are encouraged to review the "Good Health Is More Than Health Care" web content before taking the quiz. The content and a link to the quiz can be found at https://hivcareconnect.com/goodhealth. The quiz can be found at https://www.surveygizmo.com/s3/4562185/Good-Health-Is-More-Than-Health-Care-Quiz. To qualify for a prize, individuals must be living with HIV in Illinois and provide their email address, which will be kept confidential, at the end of the quiz. Those already having taken the quiz and providing their email will be eligible for the drawing as well. Winners will be notified by Feb. 22. The "Good Health Is More Than Health Care" quiz and campaign are designed to help people living with HIV to manage the social and economic conditions in which they live, learn and work. These conditions, known as "social determinants of health," have a tremendous impact on personal health. They include things such as a lack of regular housing or enough food, health care costs, language barriers, lack of access to dental and mental health care, child care responsibilities, substance abuse, transportation needs, utility stress, and more. People living with HIV who enroll in Illinois HIV Care Connect may qualify for programs that may provide assistance in overcoming some of these social and economic obstacles. Among these programs are Medicaid, Medicare, the Ryan White HIV/AIDS Program, the ADAP Medication Assistance Program (MAP), the CHIC Premium Assistance Program (PAP), Housing Opportunities for Persons with AIDS (HOPWA), and others. Depending on a person's needs and income level, benefits available through these programs may include access to medical, dental and mental health care, including child health care and treatment for substance abuse; assistance paying health insurance premiums or purchasing HIV medications; and obtaining necessary food, housing, utilities, and medically related transportation. An Illinois HIV Care Connect case manager helps enrollees to determine which benefits they quality for.